Design your reports and use the columns you need with simple drag and drop gestures. Use any field Shopify provides with the ability to group and slice the order the way you need. 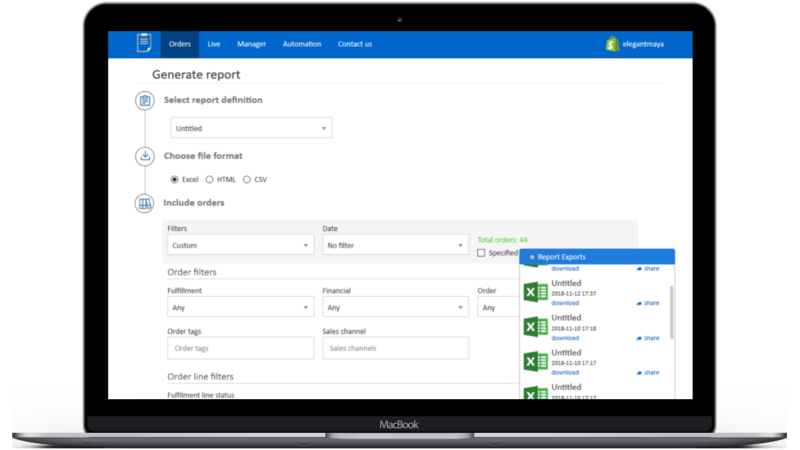 Automate the reporting with scheduled reports that can make your store running in autopilot. Customize, export, and automate your orders effortlessly! The most intuisive report designer that can help you generate any report you need. With the provided filters you can get only the data you need and nothing more. Menelabs is trusted by more than 1000 Shopify stores. We provide the best user experience with top quality standards and a top notch support. Install the app and automate your order dispaching! Created by Menelabs, 2018. All Rights Reserved.